Are you suffering from cavities, chipped or cracked teeth, tooth decay, or need an old dental restorations repaired? Whether you are dealing with common oral health issues or need more advanced dental work, restorative dentistry can renew the function and beauty of your smile. Restorative dentistry uses a combination of cosmetic procedures and modern restorations to improve your smile with natural-looking results. At Gregory J. Toone, DDS, we offer state-of-the-art restorative dental treatments in Lynchburg, VA for patients with damaged, decayed, or diseased teeth. Dr. Toone is an experienced restorative dentist and will ensure that your treatments are anxiety-free, comfortable, and effective. Before moving forward with restorative dental work, you will need to schedule a consultation, where Dr. Toone will assess your smile to determine the best treatment plan for your condition. Usually, this appointment occurs during your routine dental visit, in which we will examine the outside of your teeth’s surface, as well as take X-rays to view the condition of your teeth and gum’s under the gumline. X-rays allow us to see the extent of your tooth decay, so we can determine if the area needs a filling, root canal therapy, dental crown, or so forth. It also helps us get a better view of jawbone density, when missing tooth restorations are needed. Your consultation is also a good opportunity for you to share your dental health and cosmetic goals with our team, so we can make sure that you are comfortable and happy with your treatment plan. Do you need a cavity filled? Tooth-colored fillings, sometimes known as white fillings or composite fillings, are dental fillings that match the color of the natural tooth for a more aesthetic restoration. In the past, cavities were filled with a gold inlay or dental amalgam. Both gold and dental amalgam fillings can be unsightly, especially when they are used to fill cavities in teeth closer to the front of your mouth. Tooth-colored fillings use a durable composite resin that restore the function of the tooth without changing its color. Unlike traditional metal fillings, tooth-colored fillings also have the added benefit of bonding to the tooth in a way that insulates the tooth from temperature changes and supports the structure of the tooth. Dental implants are one of the most innovative dental restorations available today. Dental implants are commonly recommended for treating tooth loss, or teeth that are so badly decayed that your only option is extraction. During your treatment, a titanium implant is placed directly in the jawbone, which is then fitted with a crown for an effective and natural-looking tooth replacement. Unlike other tooth loss treatments, dental implants fuse to the jawbone for a more permanent and secure restoration. Dental crowns, sometimes referred to as dental caps, are custom-made tooth shaped restoration that cover the entire damaged tooth. There are multiple types of crowns, including gold, porcelain, and ceramic. 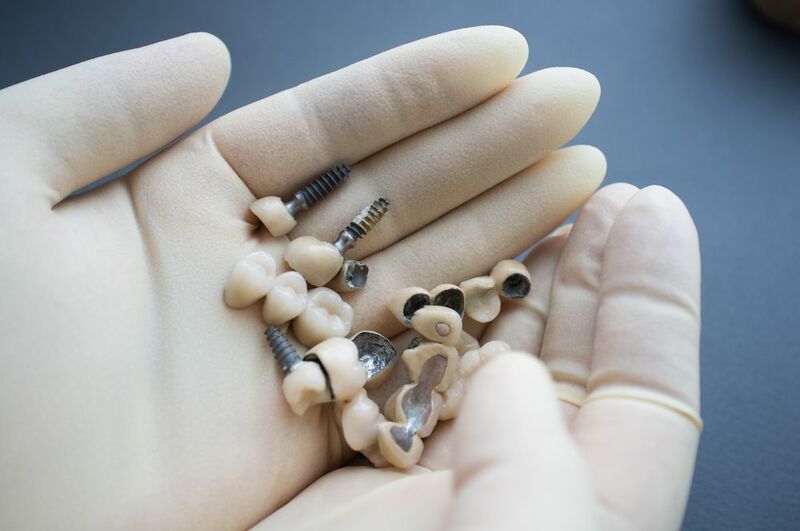 Ceramic and porcelain are the most common types of crown, since they are able to match the size, shape, and color of your teeth for a more natural-looking restoration. Dental bridges are a custom-made restoration used to replace one or more teeth by spanning over the gap of the missing tooth or teeth. Bridges consist of two dental crowns with an artificial replacement tooth, known as the pontic, in the center. The crowns cap the teeth adjacent to the missing tooth, while filling in the gap with the pontic. Unlike dental implants, bridges are not anchored directly in the jawbone and require preparation of the neighboring teeth. At the same time, dental bridges are a common dental restoration for missing teeth, since they can produce natural-looking results at a lower price than dental implants. Dentures are one of the most common restorative dental treatments for replacing missing teeth. There are two main types of dentures - partial dentures and full dentures. Partial dentures are used when there is minimal tooth loss, helping to fill the gaps of missing teeth without having to extract the surrounding teeth. Full dentures are used for replacing full arches of missing teeth, as well as teeth that are severely damaged and need extraction. Dentures can restore your ability to chew properly, while also providing a cosmetic solution by filling out your face and filling in gaps. While dentures are not considered the most comfortable dental restoration for missing teeth, they are still a great alternative for patients looking for a quick and affordable solution to their tooth loss. Choose Gregory J. Toone, DDS For Modern Dental Care!